Hello and welcome to our live coverage of stage 6 of the Vuelta a San Juan. Today's largely flat penultimate stage is 153.5km long and starts and ends at the Autódromo El Villicúm north of San Juan. Today's stage is set to kick off in around 20 minutes. 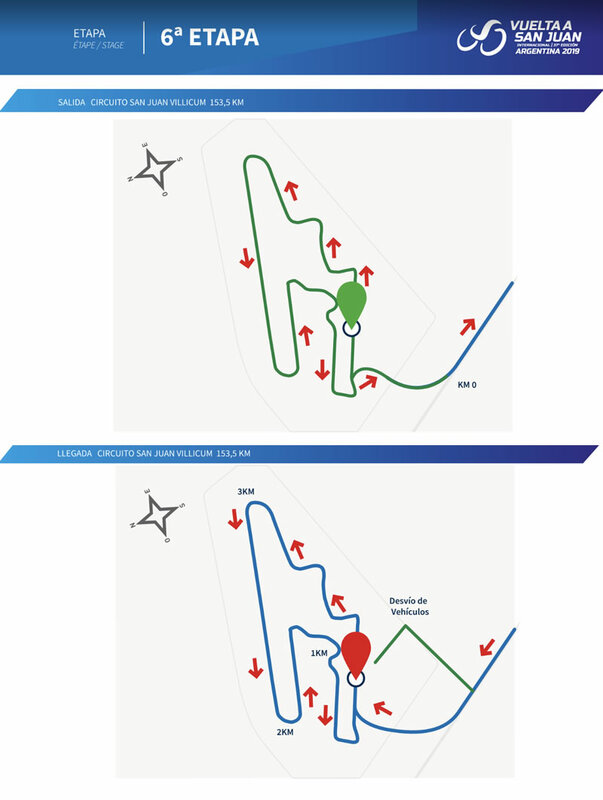 It's an out and back course which begins and ends with a lap of the racetrack. It could be one for the powerful sprinters, a breakaway, or one for the puncheurs today. It all depends on how the lumps at the end are raced. And they're off! The penultimate stage of the Vuelta a San Juan has begun. 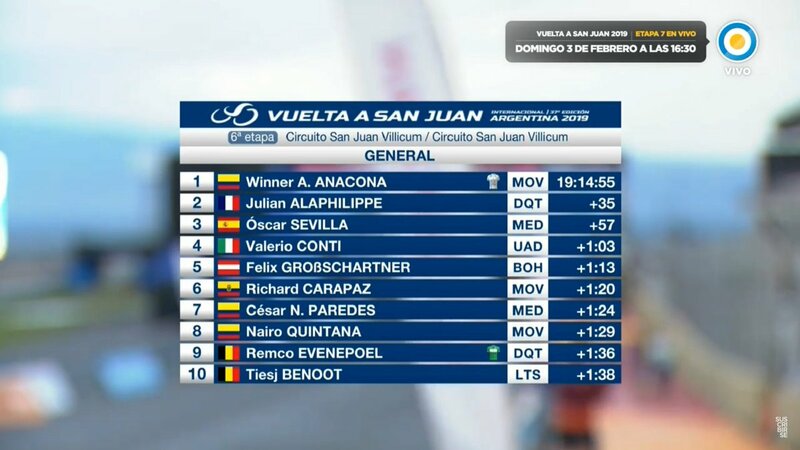 After yesterday's stage, Winner Anacona (Movistar) leads the general classification. He's in the white jersey and – with a 41-second advantage over second-placed Julian Alaphilippe – looks certain to carry it to the end of the race. A more interesting battle could be for third place. Óscar Sevilla (Medellin) rode onto the podium yesterday, but holds a slender six-second lead over Valerio Conti (UAE Team Emirates). It's possible the Italian could put in an attack later today, so keep an eye on him. Remco Evenepoel (Deceuninck-Quick Step) also holds a slender two-second lead over Gino Mäder (Dimension Data) in the U23 competition. And the race is on! After a lap of the racetrack and a further neutralised section, the peloton is racing. Felipe Peñalosa (Chile) is the first attacker of the day. Antonio Cabrera (Chile) is the first attacker of the day. A number of other riders are also attempting to get away, of course. It might be a while until an acceptable break forms. A rather large group got away, but has been caught already, just as I had started to identify them. Time to try again. More attacks coming from the peloton. First a Mexican rider, and now a Neri Sottoli rider has joined him. Dayer Quintana is the Neri Sottoli man. He is out front with Daniel Diaz (Municipalidad de Pocito) and mountain classification leader Daniel Zamora (Agrupacion Virgen De Fatima). Another rider from Agrupacion Virgen De Fatima has joined them. It's Germán Tivani, who was in the break yesterday too. There has been a crash in the peloton. Ricardo Paredes (Cuba) has hit the dirt on the side of the road. He looks ok, though. The four up front look pretty well established at this point. There's no time gap yet, but the peloton is slowing down – they're spread across the road. Ignacio Espinoza (Start Team Gusto) has gone on the attack in a bid to bridge up to the break. It's the first time I've seen a rider from the Bolivian team on the attack during the race. Still the four men up front. Meanwhile, 1:20 further back in the peloton, the pace has picked up again as riders attempt to clip off the front. Iginio Lucero and Gabriel Juarez (both Municipalidad de Rawson Somos Todos) have attacked the peloton and are 50 seconds up. Leonardo Rodriguez (Asociacion Civil Mardan) is with them. There's a lot of orange in this race between the mountain classification jersey, Nippo Vini Fantini Faizanè, Asociacion Civil Mardan, and Municipalidad de Rawson Somos Todos. Pity CCC didn't make the trip, really. Movistar have moved to the front of the peloton now. They're riding in service of race leader Winner Anacona. Reports on the ground from our reporter Stephen Farrand indicate that the finish isn't uphill as has been indicated on various stage profiles. It looks like we'll see a sprint finish on the racetrack rather than any challenges for third on GC or the U23 jersey, then. 3:30 for the break now. Things have calmed down and the chasers are back in the peloton. Oh, the chase group is out there somehwere, according to the tv graphics. We haven't seen them in a while, though. Inside the 100km mark and the break is still working well together. Still no sign of the chase group though. Movistar and Neri Sottoli - Selle Italia are on the front of the peloton. 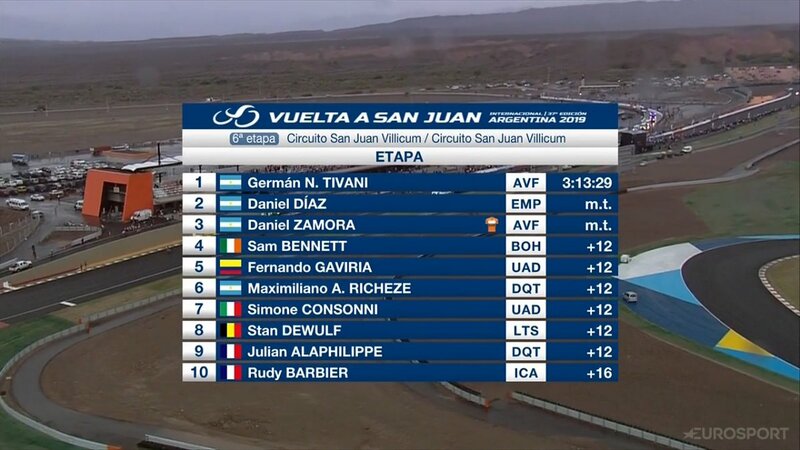 Daniel Zamora takes the first sprint of the day at Villa Santa Rosa, beating teammate Germàn Tivani and Daniel Diaz to the line. The chasers are currently three minutes down on the break and two minutes ahead of the peloton. Not really going anywhere then. There really isn't a lot going on at the moment. 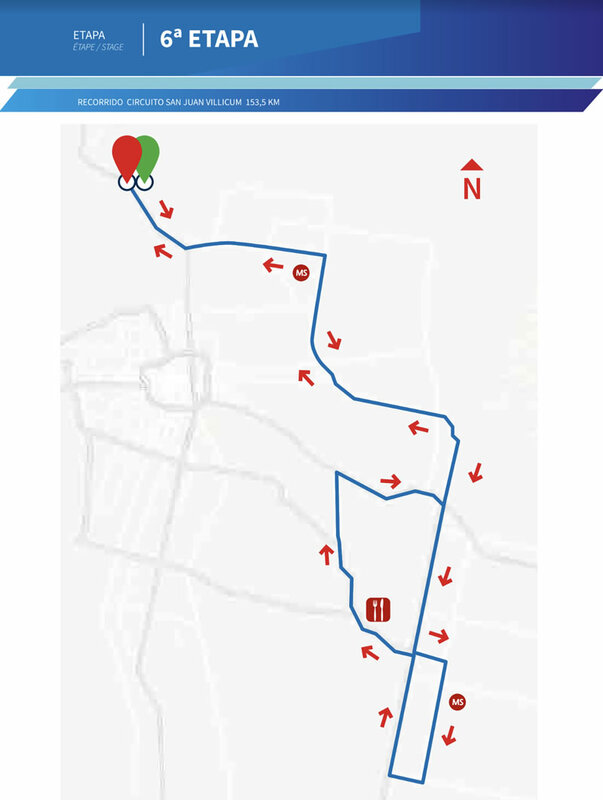 The next event, aside from the feed zone, is the intermediate sprint coming in over 60km. It's started to rain a bit, with spots showing up on the camera and the road looking a bit slick where the chase group are. They're slowing down to take on some food. The rain is coming down a lot heavier now. Still dry at the finish though. It looks like one of the riders from the chase group has dropped back to the peloton. Leonardo Rodriguez was the rider who dropped back to the peloton, I think. It's looking miserable out there for the peloton, who are racing in short-sleeved jerseys and shorts. Five minutes up the road the break are out of the rain though, so the peloton don't have to endure these conditions for much longer. The peloton has sped up in the rain. The gap to the break is down to 4:40 now. The peloton are back in the dry now too. The peloton are pushing the pace a bit now. The break's advantage has gone down from 4:40 to 4:15. Now the gap is under four minutes with less than a third of the stage to go. And still the gap comes down. Now under four minutes as the peloton keeps motoring along, led by riders from a mixture of teams including Bora-Hansgrohe, Medellin and Movistar. We're just over 10km from the second and final intermediate sprint of the stage now. Zamora, Tivani and Diaz are the virtual overall podium at the moment, but things won't stay that way. Under three minutes now, with 24km left to race. No competition for the intermediate sprint as the break just power across the line. The motorbike is showing them a 3:30 gap, while the tv grahpics show just under three minutes. Zamora, Tivani and Quintana was the order over the line. Another Cuban, Alejandro Parra, is caught up in a crash in the peloton. He doesn't look in too much trouble though. Full gas for the peloton now as they hunt down the break. The gap is melting away down towards the two-minute mark. Bora-Hansgrohe and Movistar head up the peloton. The gap is under two minutes now. Will the peloton catch the break? It looked a foregone conclusion before but now two minutes seems a lot to ask over 14km. Zamora looked in good sprinting shape when he won the first intermediate sprint of the day, so could be a decent tip to win should the break make it to the line. Zamora is the best-placed man in the break on GC. He's 14th, 2:07 down on Anacona. Not a threat to take the lead anymore then, but could jump up a few spaces here. And Dayer Quintana is the first man to drop back from the break. A valuable cog in the four-man machine is lost for the final 8km. The gap is down to a minute now. The peloton can see the break on this long straight road, but they're still a minute down. Barring disaster, the win will be contested by the breakaway trio. And the break turn on to the racetrack. The gap seems to have suddenly gone down to 40 seconds. Peter Sagan is working on the front now! Diaz, Zamora and Tivani probably didn't have this in their mind when they were rolling around this same track a few hours ago. The final kilometre for the break now! Zamora leads the trio. Zamora is still on the front. Will he lead out for Tivani? The final straight now, and Tivani launches first! Diaz doesn't have anything in response and Tivani takes a comfortable win in the sprint. Zamora takes third. The peloton rolls in just over ten seconds behind the trio. It's the first win at the race for a local team since 2016 – the final year before the race was a 2.1 UCI event. Winner Anacona holds on to his lead. He finished 33rd, 18 seconds down. Julian Alaphilippe finished ninth on the stage, six seconds ahead of Anacona. It's Tivani's victory win since June last year, when he won the first stage and overall at the 2.2 ranked Tour de Serbia. Back then, the 23 year old was racing for Bulgarian team Trevigiani Phonix-Hemus 1896, before riding as a stagiaire for UAE Team Emirates in the closing months of the season. Here's a great shot of Tivani celebrating as he crossed the line, via the Vuelta a San Juan Twitter account. The stage result graphics had suggested that Gino Mäder (Dimension Data) would be taking over the green U23 jersey today, but Remco Evenepoel just received it on the podium, so it looks like the initial results were wrong. All the jerseys remain on the same shoulders tonight. Winner Anacona retains the race leader's white jersey, Remco Evenepoel is in the green of the U23 leader, Daniel Zamora is in the orange mountain classification leader's jersey. He's also the best local and best Argentine rider and, finally, Maximiliano Navarrete is in the yellow intermediate sprints jersey. No change in the top ten on the general classification either. There's no change in the top ten on the general classification either. Tomorrow's stage is another flat one. It's 141.3km long and consists of nine laps of a flat circuit around San Juan. Not the most thrilling end to the race, but we should see the big sprint showdown that we expected today. And that's all from us today. Be sure to come back tomorrow for our live coverage from the final stage of the 2019 Vuelta a San Juan!